We’d love your help. Let us know what’s wrong with this preview of Restating Orientalism by Wael B. Hallaq. 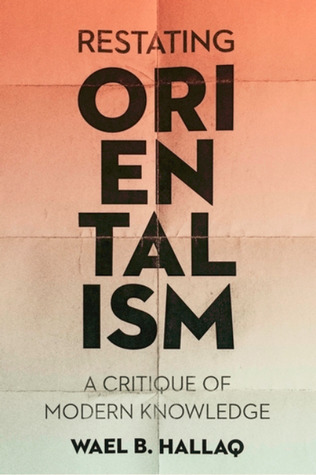 Since Edward Said's foundational work, Orientalism has been singled out for critique as the quintessential example of Western intellectuals' collaboration with oppression. Controversies over the imbrications of knowledge and power and the complicity of Orientalism in the larger project of colonialism have been waged among generations of scholars. But has Orientalism come t Since Edward Said's foundational work, Orientalism has been singled out for critique as the quintessential example of Western intellectuals' collaboration with oppression. Controversies over the imbrications of knowledge and power and the complicity of Orientalism in the larger project of colonialism have been waged among generations of scholars. But has Orientalism come to stand in for all of the sins of European modernity, at the cost of neglecting the complicity of the rest of the academic disciplines? To ask other readers questions about Restating Orientalism, please sign up. The thesis of this book is that Muslim intellectual life did not die a natural death in the mid-19th century — it was murdered. Hallaq proposes that the tarantula’s bite of modernity entails “structural genocide” of that which is pre-modern, which included the dismembering and eventual destruction of traditional Islamic institutions, extending to actual human genocide at the place of contact, notably even today in Israel. The Orientalist gaze, he says, does not extend to every sort of statement m The thesis of this book is that Muslim intellectual life did not die a natural death in the mid-19th century — it was murdered. Hallaq proposes that the tarantula’s bite of modernity entails “structural genocide” of that which is pre-modern, which included the dismembering and eventual destruction of traditional Islamic institutions, extending to actual human genocide at the place of contact, notably even today in Israel. The Orientalist gaze, he says, does not extend to every sort of statement made about the Orient by a Westerner, but is more specifically the product of a mindset that cannot tolerate the Orient and ultimately desires to destroy it. "Before the modern European subject was formed as a deployable colonist," Hallaq writes, "he was already colonized as an epistemological subject who could think the world as a generic Orientalist." 1. We should seek out the truthful core of Edward Said's book Orientalism, which has made it an academic staple despite its historical errors. 2. As a replacement for Said’s shortcomings, we should look to the metaphysical worldview of René Guénon, including his concept of East and West. Hallaq proposes that Guénon has a sharper view than Said of what Orientalism is and what it does, and how to counter-act it at the intellectual level. 3. We should take the works of Carl Schmitt as symptomatic of the state of modernity, viewing them as useful but suspicious. In particular we should question his concept of the "state of exception", instead proposing a "state of extraordinarity" which constitutes "the moment of truth in the ordinary" and brings out the unsustainable, inhumane truth of everyday life in globalist modernity. Both Nazism and Zionism serve as extraordinary expressions of the ordinary modern paradigm. 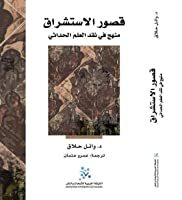 Linking his thesis into the massive, global problems of environmental crisis and alienation, Hallaq contends that we will be unable to counteract the inherent unsustainability and sociopathic nature of modernity until we are able to find an epistemologically anti-modern alternative center. Hallaq’s writings have explored the structural dynamics of legal change in pre-modern law, and have recently been examining the centrality of moral theory to understanding the history of Islamic law. His books include Ibn Taymiyya Against the Greek Logicians (1993); A History of Islamic Legal Theories An Introduction to Sunni Usul al-fiqh (1997); Authority Continuity and Change in Islamic Law (2001); and An Introduction to Islamic Law (2009). Shari‘a: Theory, Practice, Transformations (2009) examines the doctrines and practices of Islamic law within the context of its history, from its beginnings in seventh-century Arabia, through its development and transformation under the Ottomans, and across lands as diverse as India, Africa and South-East Asia, to the present. Hallaq’s work has been widely read, and translated into Arabic, Persian, Turkish, Japanese, Indonesian and Hebrew.